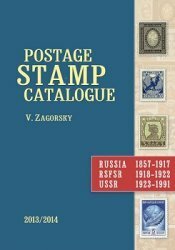 The definitive Russian stamps issued during the eight months of the Provisional Government utilized imperforate sheets of the Russian Empire postage stamps of 1889 to 1912. A lot of errors occurred during the production of these stamps, such as missing and inverted centers, inverted frames, misplaced centers, and double printings. They are all relatively common and affordable. The overthrow of the Russian monarchy happened very quickly. The February Revolution in Russia actually took place from March 8 through March 12, 1917. Czar Nicholas II abdicated on March 15, 1917. The following day, March 16, 1917, the provisional government of the Republic of Russia was formed. The Russian Civil War erupted between opposing factions following the establishment of the provisional government, and that would continue through 1922. The Russian Federation emerged as the dominate player in the struggle for the establishment of the new Socialist republic, and later in 1917, it would become the Russian Soviet Federated Socialist Republic (RSFSR), the predecessor of the Union of Soviet Socialist Republics (USSR). 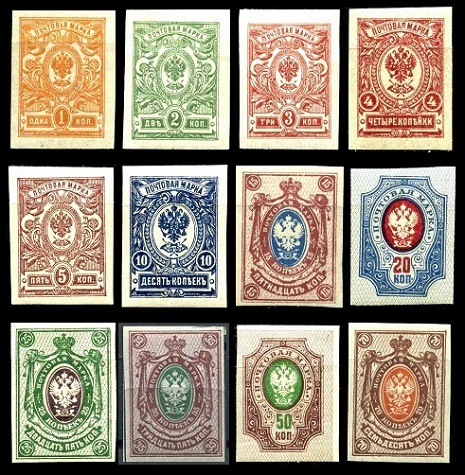 The twelve Imperial Arms type definitive Russian stamps shown above were issued in 1917 by the Provisional Government of the Republic of Russia. They are all typographed on wove paper, and they are imperforate. These Russian stamps have vertical lozenges of varnish on the surface. 01 K. (1917 - Sc. #119) - Orange. 02 K. (1917 - Sc. #120) - Gray Green. 03 K. (1917 - Sc. #121) - Red. 04 K. (1917 - Sc. #122) - Carmine. 05 K. (1917 - Sc. #123) - Claret. 10 K. (1917 - Sc. #124) - Dark Blue. 15 K. (1917 - Sc. #125) - Red Brown & Deep Blue. 20 K. (1917 - Sc. #126) - Blue & Carmine. 25 K. (1917 - Sc. #127) - Green & Gray Violet. 35 K. (1917 - Sc. #128) - Red Brown & Green. 50 K. (1917 - Sc. #129) - Brown Violet & Green. 70 K. (1917 - Sc. #130) - Brown & Orange. 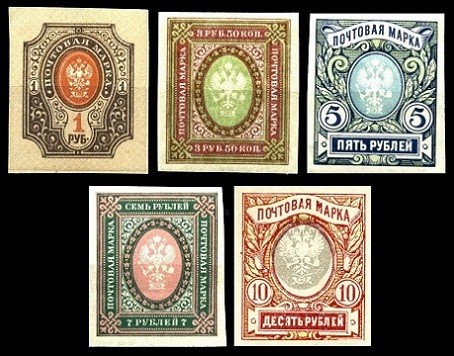 The five Imperial Arms type Ruble denomination definitive Russian stamps shown above were issued in 1917 by the Provisional Government of the Republic of Russia. They are all typographed on wove paper. 01.00 R. (1917 - Sc. #131) - Pale Brown, Brown, & Red Orange. 03.50 R. (1917 - Sc. #132) - Maroon & Light Green. 05.00 R. (1917 - Sc. #133) - Dark Blue, Green, & Pale Blue. 07.00 R. (1917 - Sc. #134) - Dark Green & Pink. 10.00 R. (1917 - Sc. #135) - Scarlet, Yellow, & Gray. 03.50 R. (1917 - Sc. #137) - Maroon & Light Green. 07.00 R. (1917 - Sc. #138) - Dark Green & Pink. 03.50 R. (1917 - Sc. #137a) - Maroon & Light Green. 07.00 R. (1917 - Sc. #138a) - Dark Green & Pink. 01.00 R. (1917 - Sc. #87g) - Pale Brown, Brown, & Red Orange. 03.50 R. (1917 - Sc. #137b) - Maroon & Light Green. 07.00 R. (1917 - Sc. #138b) - Dark Green & Pink. 01.00 R. (1917 - Sc. #87h) - Pale Brown, Brown, & Red Orange. 03.50 R. (1917 - Sc. #137d) - Maroon & Light Green. 07.00 R. (1917 - Sc. #138c) - Dark Green & Pink. 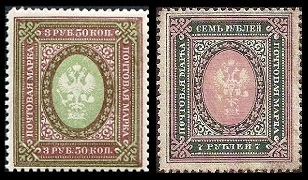 The three Romanov Dynasty type Russian stamps shown above were issued in 1917, due to a coinage shortage. 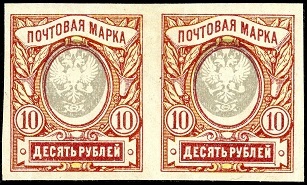 These Russian "stamps" are printed on thin cardboard, and they were issued to be used in the place of coins. The reverse of each of these Russian "stamps" has the Imperial Arms, the value, and a four line inscription meaning "Having circulation on par with silver subsidiary coins". 01 K. on 01 K. (1917 - Sc. #139) - Czar Peter I. 02 K. on 02 K. (1917 - Sc. #140) - Czar Alexander II. 03 K. (1917 - Sc. #141) - Czar Alexander III. 01 K. on 01 K. (1917 - Sc. #139a) - Czar Peter I. 02 K. on 02 K. (1917 - Sc. #140a) - Czar Alexander II. 03 K. (1917 - Sc. #141a) - Czar Alexander III.